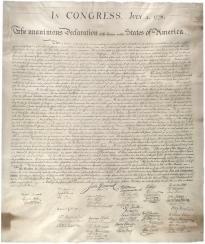 View the Declaration in the Gilder Lehrman Collection by clicking here and here. For additional primary resources click here and here. While the unit is intended to flow over a five-day period, it is possible to present and complete the material within a shorter time frame. For example, the first two days can be used to ensure an understanding of the process with all of the activity completed in class. The teacher can then assign lessons three and four as homework. The argumentative essay is then written in class on day three. Students will be asked to "read like a detective" and gain a clear understanding of the Declaration of Independence. Through reading and analyzing the original text, the students will know what is explicitly stated, draw logical inferences, and demonstrate these skills by writing a succinct summary and then restating that summary in the student’s own words. In the first lesson this will be facilitated by the teacher and done as a whole-class lesson. Tell the students that they will be learning what Thomas Jefferson wrote in 1776 that served to announce the creation of a new nation by reading and understanding Jefferson’s own words. Resist the temptation to put the Declaration into too much context. Remember, we are trying to let the students discover what Jefferson and the Continental Congress had to say and then develop ideas based solely on the original text. Teacher Resource: Complete text of the Declaration of Independence (PDF). This transcript of the Declaration of Independence is from the National Archives online resource The Charters of Freedom. All students are given an abridged copy of the Declaration of Independence and are asked to read it silently to themselves. The teacher then "share reads" the text with the students. This is done by having the students follow along silently while the teacher begins reading aloud. The teacher models prosody, inflection, and punctuation. The teacher then asks the class to join in with the reading after a few sentences while the teacher continues to read along with the students, still serving as the model for the class. This technique will support struggling readers as well as English Language Learners (ELL). The teacher explains that the students will be analyzing the first part of the text today and that they will be learning how to do in-depth analysis for themselves. All students are given a copy of Summary Organizer #1. This contains the first selection from the Declaration of Independence. Explain that the objective is to select "Key Words" from the first section and then use those words to create a summary sentence that demonstrates an understanding of what Jefferson was saying in the first paragraph. Guidelines for selecting the Key Words: Key Words are very important contributors to understanding the text. Without them the selection would not make sense. These words are usually nouns or verbs. Don’t pick "connector" words (are, is, the, and, so, etc.). The number of Key Words depends on the length of the original selection. This selection is 181 words so we can pick ten Key Words. The other Key Words rule is that we cannot pick words if we don’t know what they mean. Students will now select ten words from the text that they believe are Key Words and write them in the box to the right of the text on their organizers. The teacher surveys the class to find out what the most popular choices were. The teacher can either tally this or just survey by a show of hands. Using this vote and some discussion the class should, with guidance from the teacher, decide on ten Key Words. For example, let’s say that the class decides on the following words: necessary, dissolve, political bonds (yes, technically these are two words, but you can allow such things if it makes sense to do so; just don’t let whole phrases get by), declare, separation, self-evident, created equal, liberty, abolish, and government. Now, no matter which words the students had previously selected, have them write the words agreed upon by the class or chosen by you into the Key Words box in their organizers. The teacher now explains that, using these Key Words, the class will write a sentence that restates or summarizes what was stated in the Declaration. This should be a whole-class discussion-and-negotiation process. For example, "It is necessary for us to dissolve our political bonds and declare a separation; it is self-evident that we are created equal and should have liberty, so we need to abolish our current government." You might find that the class decides they don’t need the some of the words to make it even more streamlined. This is part of the negotiation process. The final negotiated sentence is copied into the organizer in the third section under the original text and Key Words sections. The teacher explains that students will now be putting their summary sentence into their own words, not having to use Jefferson’s words. Again, this is a class discussion-and-negotiation process. For example, "We need to get rid of our old government so we can be free." Wrap up: Discuss vocabulary that the students found confusing or difficult. If you choose, you could have students use the back of their organizers to make a note of these words and their meanings. Students will be asked to "read like a detective" and gain a clear understanding of what Thomas Jefferson was writing about in the Declaration of Independence. Through reading and analyzing the original text, the students will know what is explicitly stated, draw logical inferences, and demonstrate these skills by writing a succinct summary and then restating that summary in the student’s own words. In the second lesson the students will work with partners and in small groups. Tell the students that they will be further exploring the meaning of the Declaration of Independence by reading and understanding Jefferson’s text and then being able to tell, in their own words, what he said. Today they will be working with partners and in small groups. All students are given the abridged copy of the Declaration of Independence and are asked to read it silently to themselves. The teacher then "share reads" the second selection with the students. This is done by having the students follow along silently while the teacher begins reading aloud. The teacher models prosody, inflection, and punctuation. The teacher then asks the class to join in with the reading after a couple of sentences while the teacher continues to read along with the students, still serving as the model for the class. This technique will support struggling readers as well as English Language Learners (ELL). The teacher explains that the class will be analyzing the second selection from the Declaration of Independence today. All students are given a copy of Summary Organizer #2. This contains the second selection from the Declaration. The teacher puts a copy of Summary Organizer #2 on display in a format large enough for all of the class to see (an overhead projector, Elmo projector, or similar device). Explain that today they will be going through the same process as yesterday but with partners and in small groups. Explain that the objective is still to select "Key Words" from the second selection and then use those words to create a summary sentence that demonstrates an understanding of what Jefferson was saying in that selection. Guidelines for selecting the Key Words: The guidelines for selecting Key Words are the same as they were yesterday. However, because this paragraph is shorter than the last one at 148 words, they can pick only seven or eight Key Words. Pair the students up and have them negotiate which Key Words to select. After they have decided on their words both students will write them in the Key Words box of their organizers. The teacher now puts two pairs together. These two pairs go through the same negotiation-and-discussion process to come up with their Key Words. Be strategic in how you make your groups to ensure the most participation by all group members. The teacher now explains that by using these Key Words the group will build a sentence that restates or summarizes what Thomas Jefferson was saying. This is done by the group negotiating with its members on how best to build that sentence. Try to make sure that everyone is contributing to the process. It is very easy for one student to take control of the entire process and for the other students to let them do so. All of the students should write their negotiated sentence into their organizers. The teacher asks for the groups to share out the summary sentences they have created. This should start a teacher-led discussion that points out the qualities of the various attempts. How successful were the groups at understanding the Declaration and were they careful to only use Jefferson’s Key Words in doing so? The teacher explains that the group will now be putting their summary sentence into their own words, not having to use Jefferson’s words. Again, this is a group discussion-and-negotiation process. After they have decided on a sentence it should be written into their organizers. Again, the teacher should have the groups share out and discuss the clarity and quality of the groups’ attempts. Students will be asked to "read like a detective" and gain a clear understanding of the meaning of the Declaration of Indpendence. Through reading and analyzing the original text, the students will know what is explicitly stated, draw logical inferences, and demonstrate these skills by writing a succinct summary and then restating that summary in the student’s own words. In this lesson the students will be working individually. Tell the students that they will be further exploring what Thomas Jefferson was saying in the third selection from the Declaration of Independence by reading and understanding Jefferson’s words and then being able to tell, in their own words, what he said. Today they will be working by themselves on their summaries. The students and teacher discuss what they did yesterday and what they decided was the meaning of the first two selections. The teacher then "share reads" the third selection with the students. This is done by having the students follow along silently while the teacher begins reading aloud. The teacher models prosody, inflection, and punctuation. The teacher then asks the class to join in with the reading after a couple of sentences while the teacher continues to read along with the students, still serving as the model for the class. This technique will support struggling readers as well as English Language Learners (ELL). The teacher explains that the class will be analyzing the third selection from the Declaration of Independence today. All students are given a copy of Summary Organizer #3. This contains the third selection from the Declaration. Explain that the objective is still to select "Key Words" from the third paragraph and then use those words to create a summary sentence that demonstrates an understanding of what Jefferson was saying in that selection. Guidelines for selecting the Key Words: The guidelines for selecting Key Words are the same as they were yesterday. However, because this paragraph is longer (208 words) they can pick ten Key Words. Have the students decide which Key Words to select. After they have chosen their words they will write them in the Key Words box of their organizers. The teacher explains that, using these Key Words, each student will build a sentence that restates or summarizes what Jefferson was saying. They should write their summary sentences into their organizers. The teacher explains that they will be putting their summary sentence into their own words, not having to use Jefferson’s words. This should be added to their organizers. The teacher asks for students to share out the summary sentences they have created. This should start a teacher-led discussion that points out the qualities of the various attempts. How successful were the students at understanding what Jefferson was writing about? Tell the students that they will be further exploring what Thomas Jefferson was saying in the fourth selection from the Declaration of Independence by reading and understanding Jefferson’s words and then being able to tell, in their own words, what he said. Today they will be working by themselves on their summaries. The students and teacher discuss what they did yesterday and what they decided was the meaning of the first three selections. The teacher then "share reads" the fourth selection with the students. This is done by having the students follow along silently while the teacher begins reading aloud. The teacher models prosody, inflection, and punctuation. The teacher then asks the class to join in with the reading after a couple of sentences while the teacher continues to read along with the students, still serving as the model for the class. This technique will support struggling readers as well as English Language Learners (ELL). The teacher explains that the class will be analyzing the fourth selection from the Declaration of Independence today. All students are given a copy of Summary Organizer #4. This contains the fourth selection from the Declaration. The teacher puts a copy of Summary Organizer #4 on display in a format large enough for all of the class to see (an overhead projector, Elmo projector, or similar device). Explain that today they will be going through the same process as yesterday, but they will be working by themselves. Explain that the objective is still to select "Key Words" from the fourth paragraph and then use those words to create a summary sentence that demonstrates an understanding of what Jefferson was saying in that selection. Guidelines for selecting the Key Words: The guidelines for selecting Key Words are the same as they were yesterday. Because this paragraph is the longest (more than 219 words) it will be challenging for them to select only ten Key Words. However, the purpose of this exercise is for the students to get at the most important content of the selection. The teacher explains that now they will be putting their summary sentence into their own words, not having to use Jefferson’s words. This should be added to their organizers. This lesson has two objectives. First, the students will synthesize the work of the last four days and demonstrate that they understand what Jefferson was saying in the Declaration of Independence. Second, the teacher will ask questions of the students that require them to make inferences from the text and also require them to support their conclusions in a short essay with explicit information from the text. Tell the students that they will be reviewing what Thomas Jefferson was saying in the Declaration of Independence. Second, you will be asking them to write a short argumentative essay about the Declaration; explain that their conclusions must be backed up by evidence taken directly from the text. All students are given the abridged copy of the Declaration of Independence and then are asked to read it silently to themselves. The teacher asks the students for their best personal summary of selection one. This is done as a negotiation or discussion. The teacher may write this short sentence on the overhead or similar device. The same procedure is used for selections two, three, and four. When they are finished the class should have a summary, either written or oral, of the Declaration in only a few sentences. This should give the students a way to state what the general purpose or purposes of the document were. The teacher can have the students write a short essay now addressing one of the following prompts or do a short lesson on constructing an argumentative essay. If the latter is the case, save the essay writing until the next class period or assign it for homework. Remind the students that any arguments they make must be backed up with words taken directly from the Declaration of Independence. The first prompt is designed to be the easiest. What are the key arguments that Thomas Jefferson makes for the colonies’ separation from Great Britain? Can the Declaration of Independence be considered a declaration of war? Using evidence from the text argue whether this is or is not true. Thomas Jefferson defines what the role of government should and should not be. How does he make these arguments?